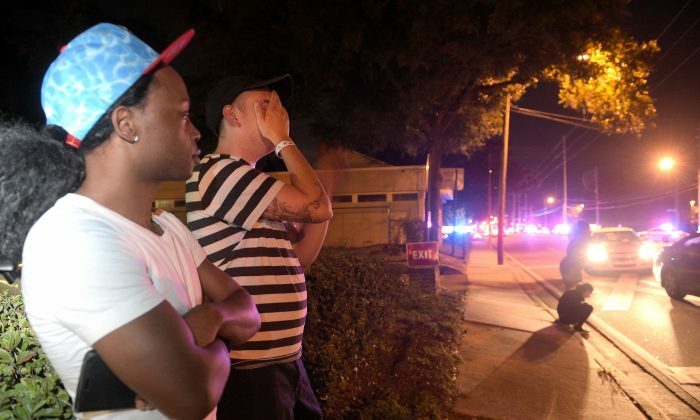 At least 50 people were shot and killed at a nightclub in Orlando, Florida, early on Sunday morning, according to officials. The mayor of Orlando says there were 50 casualties and there are 53 more hospitalized, AP reported. “There’s blood everywhere,” Mayor Buddy Dyer said Sunday, describing it as the “worst mass shooting in U.S. history,” News6 reported. The mayor said that the shooter was armed with an assault rifle and other weapons. Officials said he may have had a device strapped to himself. Earlier in the day, U.S. Rep. Alan Grayson identified the shooter as Omar Mateen of Port St. Lucie, Florida. He cited law enforcement officials when he was speaking to reporters, according to AP. “We will devote every resource available to assist with the shooting in Orlando. Our state emergency operations center is also monitoring this tragic incident,” Fla. Gov. Rick Scott said. Officials said that the situation developed after the gunman stormed into the Pulse Nightclub at around 2 a.m. local time. He was shot and killed about three hours later when a SWAT team entered the club, police told NBC News. The incident is being investigated as a terrorist attack, officials said. “We are looking at probably in the range of 20 [dead], but we don’t want to give you an exact figure,” Orlando Police Chief John Mina said during a news conference, per NBC. Mina said a uniformed officer working extra duty engaged in a gun battle with the suspect. The incident then developed into a hostage situation. “A little after 5 a.m. this morning we made the decision to go in on a rescue,” Mina said, adding that an officer was shot in the head.